I need to work on the priority of blogging while away apparently. Going from the hectic nature of the beginning of the month, to travel to the NC coast for family, and back to the craziness of work again, has left little time for focus on balance again. I was able to get some balance in while away though. NC proved quite welcoming for acquisition of lifers for me. May not seem like much, but I'm happy with 9 lifers while there, including my first banded bird. 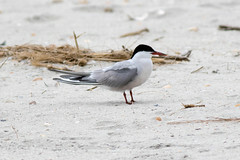 My first Common Tern (Lifer 1) I was able to fit in between rain showers on Holden Beach on 9/6. This little guy stuck out amongst the larger Royal Terns there. 9/8 brought a gorgeous morning at Fort Fisher with some nice low light. My first ever Western Sandpipers (Lifer 2) were mixed in with some Least Sandpipers and Semipalmated Plovers. 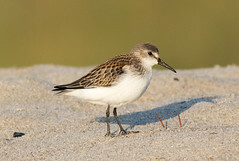 Not a lifer, but this is my first run-in with a Semipalmated Sandpiper female. Thought I had a great shot of a Western, with the brown scapulars, but alas I was informed of my error. 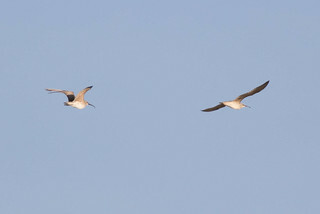 I was also lucky enough to be looking up at the right time to catch this pair of Whimbrel (Lifer 4) flying overhead. Would have loved to have caught them on the beach to get a better look at those crazy curved bills. 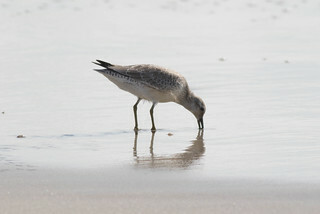 On the way back up the beach this Red Knot (Lifer 5) was hanging out with a Willet and a Sanderling. Allowing a great size comparison between the two known birds. My last lifer at Fort Fisher for the day. 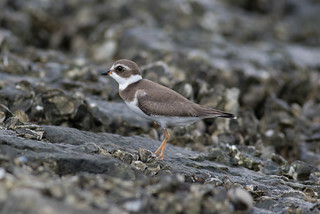 I moved on to Federal Point from there, hoping from some shorebirds out on the rocks. It was a little disappointing as far as quantity. A White Ibis gave me a brief glance, and some decent close looks at Ruddy Turnstones and my best shots of Semipalmated Plovers. I unfortunately don't have Semipalmated feet to walk amongst these rocks. This resulted in a less than magnanimous incident. Let's just say it involved what would have been a rather funny, unintentional roll around the rocks. My first true battle wounds while birding. Whoot!!! Whoot!!! I moved on down to Mason Inlet after lunch downtown Wilmington with my parents. Real Greek food, yummy. 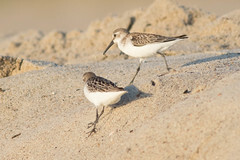 After a nice little hike to get away from some of the crowds, I found large groups of shorebirds. More Black-bellied Plovers, Semipalmated Plovers, Short-billed Dowitchers, Western/Least/Semipalmated Peeps along with Willets and Sanderlings. 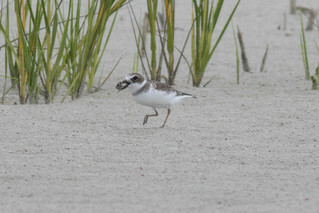 Amongst the Semipalmated Plovers I was able to pick out this Wilson's Plover (Lifer 6) showing off his catch. September 10th allowed another small window of opportunity to get out again. I opted for Fort Fisher again, as I was better prepared for the mosquito onslaught of the Basin Trail. The passerines were disappointing for the most part. Still have a song recorded I haven't ID'ed yet, but very lousy shots of one passerine lifer there, Seaside Sparrow (Lifer 9), was there. Hands down the best bird, for me, of the trip was my first banded bird. 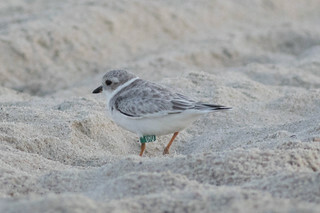 This lone Piping Plover (Lifer 7) was nearly invisible just north of the rocky overlook at Fort Fisher. I have as of yet, not heard back from Virginia Tech on information about this bird. The rest of the Spit continued to have large groups of BBPL, Sanderlings, Willets, Peeps, Semipalmated Plovers, Ruddy Turnstones, some Short-billed Dowitchers, and a Red Knot. 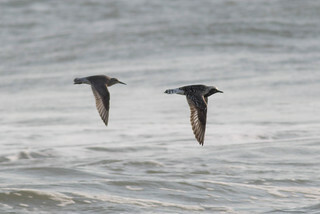 A Red Knot and Black-bellied Plover gave me a fantastic opportunity at a flight shot. Unfortunately the backlighting limited what I could pull off, with my limited skills. I braved the path up "Cirith Ungol", also known as the Basin Trail. Not a place for the arachnophobes, with rather sizable spiders in the path. Much easier to just skip ahead to the boardwalk. 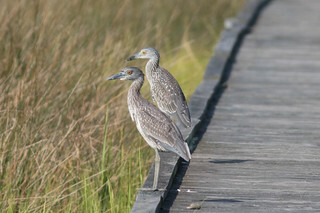 Just as had been previously reported there, juvenile Yellow-crowned Night-Heron were to be found sitting on the boardwalk. 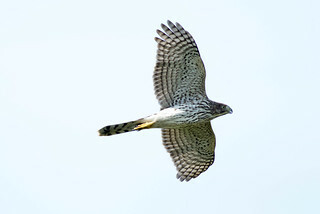 A Cooper's Hawk gave me a couple of good looks as it hunted over the marsh, as well as a Merlin briefly. White Ibis, Snowy and Great Egret, Little Blue and Great Blue Heron, American Oystercatcher, Tricolored Heron were to be found out in the marsh areas around the boardwalk. All in all, a nice little group of birds to get to spend some time with.